What if the devil himself decided to write a few letters? Satan has a lot of pride and his feelings are hurt. So many lackadaisical Catholics no longer believe in him. 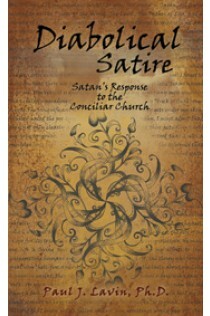 To make himself known, Satan offers thirteen “epistles.” He states most clearly that he is the inspiration for all the novelties that came out of Vatican II. The destructive impact of the changes is so well documented, it’s hard to believe anyone can fail to recognize them. However, even today, some try to justify the changes. They contend that the current novelties have somehow “evolved” and are historically connected to the pre-conciliar Catholic Church. Now the lightbearer has come out of hiding to claim ownership of the novelties in the Church. Sure, he likes confused Catholics, but his pride demands more. In his thirteen epistles, he writes about the Mass, cohabitation, foul language, blasphemy, sins of the flesh, family life, technology, the ever-widening generation gap, human suffering, and more. in the Catholic Church since Vatican II.